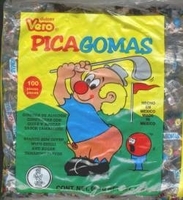 Pica Gomas is a tamarind flavored Mexican gummy candy by Vero. This is a chewy gummy that is covered with chili and a sugar tamarind flavor. Imported from Mexico, a spicy little treat. Each bag of Vero Picagomas are individually wrapped and has 100 piecies.